If you are here for the STT Valentine Treats Blog Hop, please click HERE. 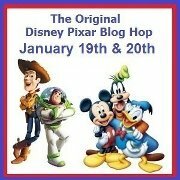 Welcome to the original, and best, Disney Pixar Blog Hop! I have been a participant in each of these very special hops since their inception oh-my-gosh-HOW-many-years-ago? !, and it is always my pleasure to participate with this great group of gals, including my "Sistah" Shawn Mosch, the Hop Hostess. Tigger and/or Charlotte, same description: "unstopapabibble." I have a dream, and I'll let you in on it. I'm hoping that one day soon, I'll be able to take my hubby, our daughter Emily, her husband Josh and their daughter (my granddaughter), 2-year old Charlotte, on a special trip to Disney World. It will be Charlotte's first trip to the Magic Kingdom! We're hoping to go in May if we can swing it financially. enhanced it with gold Stickles. I added the flying Dumbo, popping him up with pop-dots. 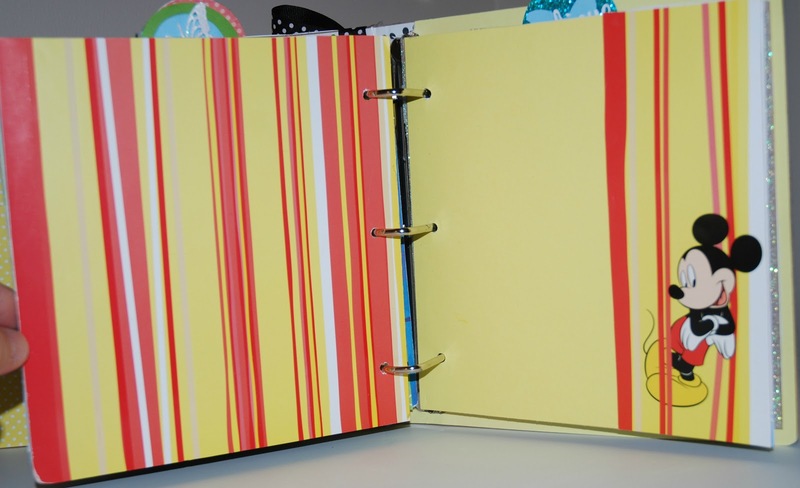 There's room for a family photo on the inside cover. 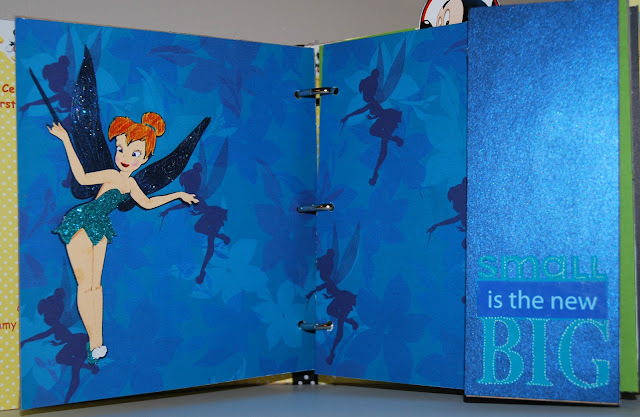 Charlotte is our family's little pixie, so what better way to honor her spirit with a Tinkerbell layout on the next page? I set that using my computer and glued it over the cut letters. I enhanced the letters with white gel pen. There's room for photos under Tink's left hand, which is left loose, to tuck the photos under. I'm not sure how many rides we'll be able to go on in the week we'll be in Orlando -- Charlotte's little, and I don't do roller coasters as I've had several head injuries (including one on a Disney roller coaster, the Rock'n Roller Coaster!). But I'm sure they'll evoke some screams, hoots and laughter! 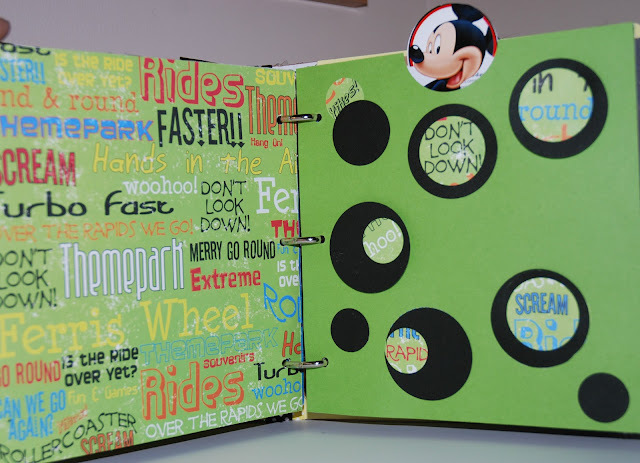 This layout celebrates that shouting -- and leaves room for a 4x6" picture under the circles at right. 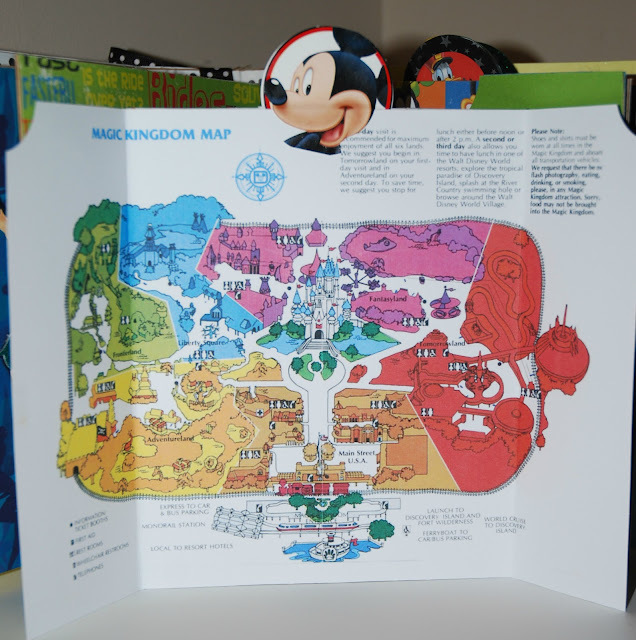 I found the Magic Kingdon map on Google. Just search: "Image - Magic Kingdom map". The following page allows room for writing or photographs of our stay in Orlando. We're planning on staying in a family villa nearby, so we'll have details about it here, and photos of course! Mickey's right ear, and more "stuff" in the pocket. 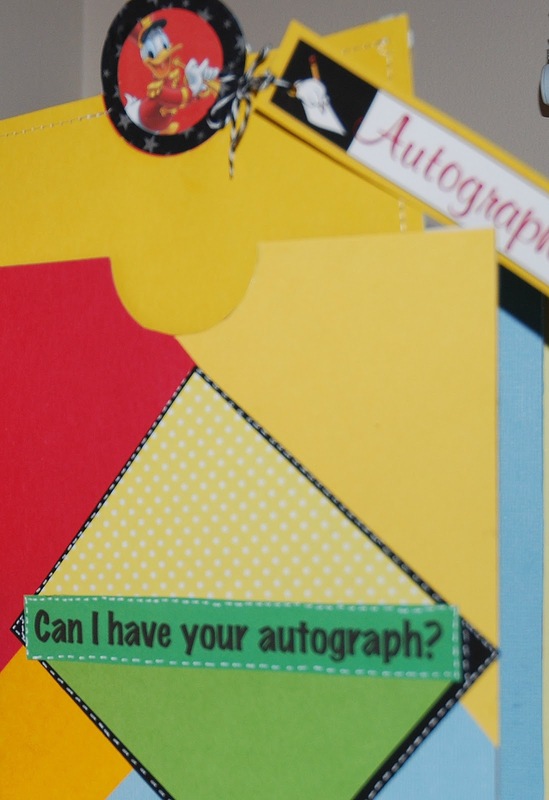 The inside back cover also has room for autographs! I'm hoping for a pretty Charlotte portrait at right, taken during a planned visit to the Bippity-Boppity Boutique! 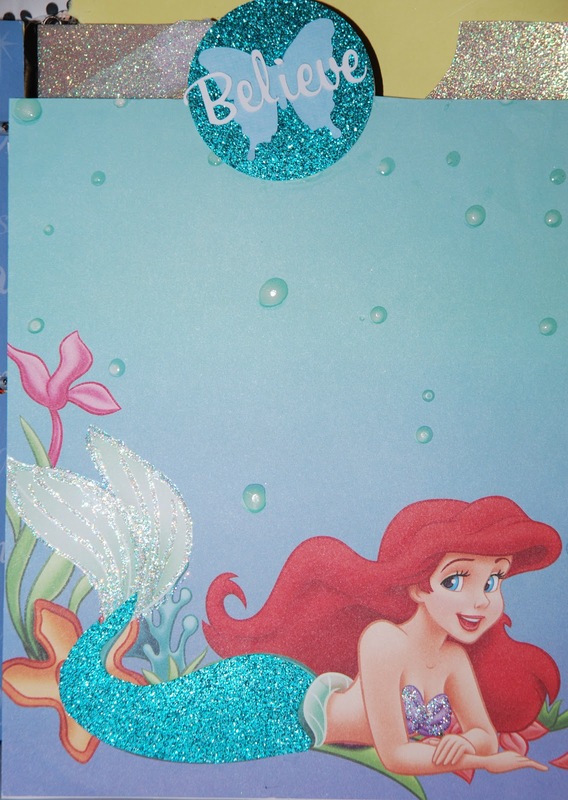 bubbles in Ariel's ocean seem real! I certainly hope you had fun Dreaming Big with me. Maybe, just maybe, with a bit of glitter and pixie dust, wishing upon a star, the wish will come true. We'll see!! What is your first Disney memory? Is it of a particular character, an event, a television show, a movie, or a visit to one of the Magic Kingdoms?? I'll tell you my oldest Disney memory: It was July 1961 and our local drive-in movie theater had a special showing of the animated "101 Dalmatians". 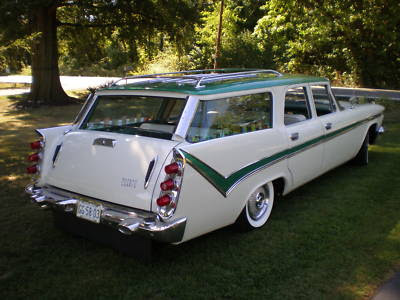 I was five years old, and my sister Janet was seven, and we were in the back seat of Dad's Dodge DeSoto station wagon. I was petrified of Cruella deVille, and somehow my sister decided to call me "CruEllen DeSoto" ... grrrrr....! S-i-s-t-e-r-s!!! 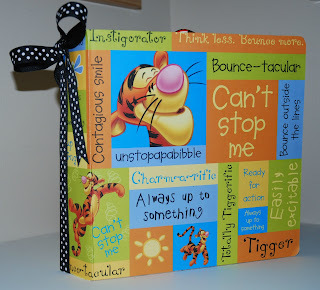 In a comment to this posting, share with me your first Disney memory, and be a follower of my CardMonkey blog, and you'll be eligible to win some special DISNEY BLOG CANDY! Want to know what it is?? It's a $25 Disney Gift Card that you can use to "shop, dine, stay or play" ... at a Magic Kingdom, online, or at a Disney store! How cool is THAT!? In your comment, please be sure to leave a way for me to contact you when you win. Everybody's eligible, even non-US citizens! 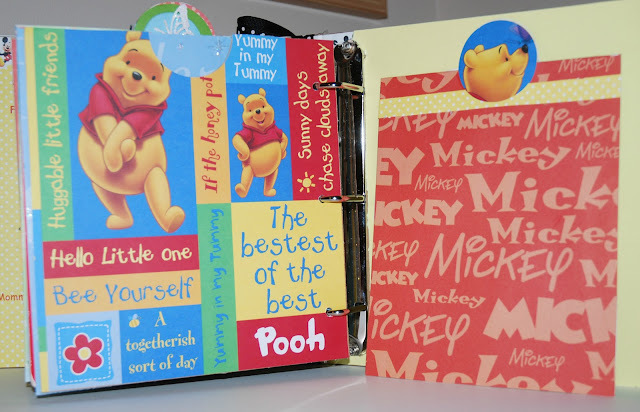 So now it is time for you to mosey on over to the next stop on today's Disney Pixar Blog Hop: Go to JAMIE at her Little Bits of Paper blogspot. Her blog is simply fantastic, and I can't wait to see what Disney project she has for us today! CruELLEN - how cruel your sister was!!! Your mini album is so precious!!! I am giddy for you and crossing my fingers that you get your granddaughter to Disney!!! 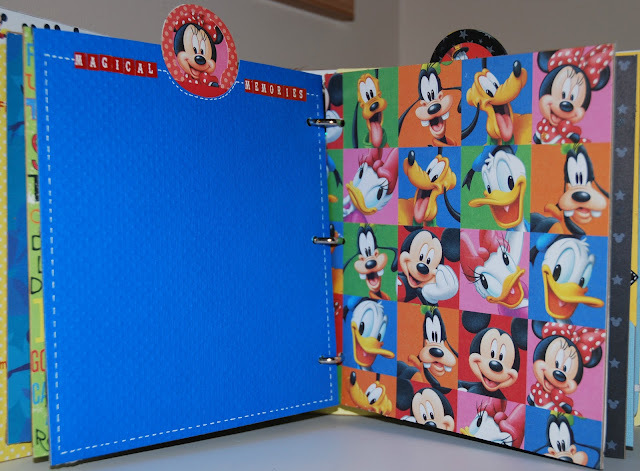 My husband is an awesome planner and spends a ton of time on the mom's panel of disney.com. We are hoping to go next October!!! So glad to be in this hop with you!!! 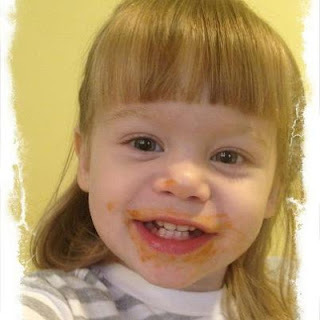 Your little Charlotte is adorable!! We were so fortunate 4 years ago to take a family vacation to Florida with our grown sons, DIL and granddaughter. We also were able to visit Disney World. Loved it!! My earliest memories is watching Pinocchio on TV when I was younger and loving Jiminy Cricket! LOVE, LOVE, LOVE this album!!!!! First Disney memory . . . watching the Mickey Mouse Club after school every day. I'm so happy that you can NOW laugh about your Cru-ELLEN experience ! 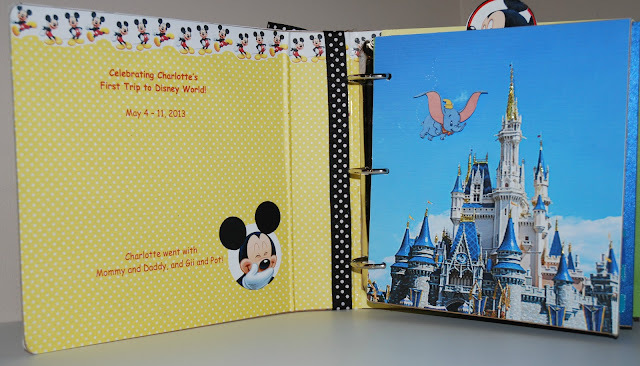 Your pages are magical and I know you will go and make sweet, adorable Charlotte one happy little Princess at Disney. Luckily, we've been there many times since we live in Florida but my first and most memorable was with our sons when they were little and we saw it through THEIR eyes! I wish you the same Magical moments.Thrilled to be in this hop with you! 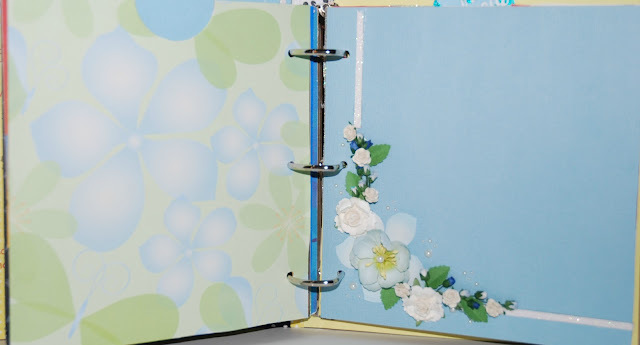 Ellen, I know how much work goes into a special memory book like this and you did a fabulous job! 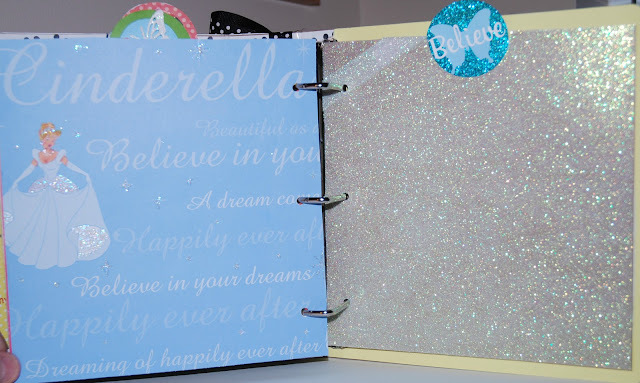 I am going to be sending some extra pixie dust your way that everything works out for your trip! There is nothing more magical then experiencing Disney with a child. As a matter of fact, that is my most magical Disney memory...the first time we took our oldest (now almost 13) when he was 18 months old. When he first stepped foot onto Main Street at the Magic Kinddom and started dancing I was a goner! What a great mini! I love the layouts you prepared. My first Disney memory is the old Mickey Mouse club on TV, Annette and all. (Dating myself, aren't I? LOL) I am now a follower. I can't believe your little Charlotte has gotten so big. Where on earth does the time go?! Great job on the album. Best wishes for your Disney trip. First off I LOVE this mini album and so hope you get to fill it with memories for that cute little pixie..
First Disney memory...I remember being on a plane (about 6) and not knowing we were going to Florida, but thinking Jacksonville where my aunt lived...when they said we would be landing in Orlando..my sister and I freaked out and our parents told us we were going to Disney World!! goc1122@yahoo.com...I always forget the contact info. The mini abbum is fantastic!! Super special, have a wonderful trip. I can't believe you hurt your head so much on coasters. "Lady & The Tramp' & 'Song of the South'. Plus I lived near by, so I also worked at Disney. The last time I was there, was when 'Make a Wish' sent my son (my icon avvie) there for his wish before he passed. Don't know if I could go back now. My favorite Disney memory is of course the first time I visited the theme parks bak in 2008. Seeing Cinderella's castle and the wishes fireworks show. I was beyond amazed that the tinker bell was a real person flying in the sky! That blew me away and since then I have gone back every year! This book is fabulous. I love the pocket pages with tags. They are simply fabulous. I'm not sure what my earliest Disney memory is. I've never been to the Magic Kingdom but who can forget seeing Mickey mouse on tv. Not to mention the Mickey Mouse Club. 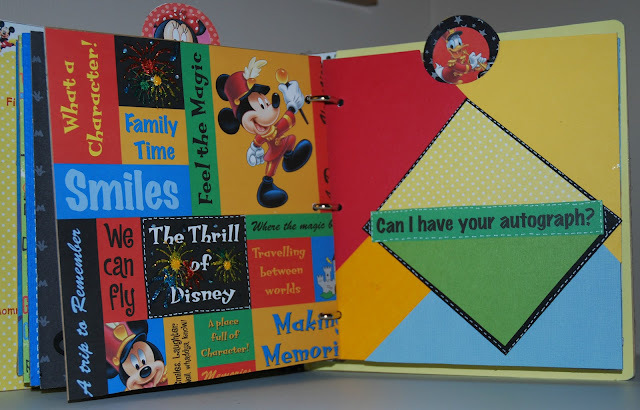 What a beautiful fun mini album, I love so many different idea you used in this book (many I am going to scraplift LOL) My favorite memory of Disneyland is 1985 the year after my father passed away and my whole family went for a holiday there except for my poor hubby he had to work. There were 14 of us that walk through the gates and what a wonderful trip it was. Love your album and so hope you get to go. I have two memories: one as a child and one as an adult. As a child I saw Bambie and cried and cried when Bambie's mom died. I couldn't believe they could be so cruel. Maybe that's why I was the only one in my family who never went deer hunting. As an adult, I finally got to go to Disney World and Epcot center and I was more in love with Epcot Center. My computer geekness came out. I have been to Epcot Center twice and would love to go back again one day. Longtime follower! Great keepsake book as your little one grows. We live half an hour from Disneyland and made annual trips at the least and whenever out of town visitors came over. Our family usually went at night for my dads company employee night. I rarely went during the day. I would run from ride to ride and covetted my E tickets. It was a totally different experience than it is now with unlimited passes. I still love all the parades and my favorite ride is Space Mountain. I love your mini!!! I'll be keeping my fingers and toes crossed and wishing big that you will all get to go. I think my first "Disney" memory was when our family went to The Love Bug movie also at a drive-in. Now imagine if you will I have SEVEN siblings. Going anywhere with the 10 of us was quite an adventure. Never enough seats in the car. Of course back then we didn't have seatbelts. We would just pile in where ever we fit. We would bring lawnchairs and sit around and on top of the car. I can just imagine what the people next to us thought. lol. What a wonderful mini album! Here's hoping and praying you'll be able to finish it off this year with photos of your family's trip. I really don't remember what my first Disney experience or memory is. My first quite vivid Disney memory is visiting Disney World in Florida when it was only about half finished -- there were still a lot of things under construction and not open to the public at the time -- so now I'm showing my age, too. Love your mini album! It's perfect to capture all her firsts! Growing in southern CA, we visited Disneyland alot, but my best memory was when I took my 3 kids for the first time. I love watching them enjoy all their own firsts. Thanks for sharing! Love your mini album, and I hope you all have a wonderful time at the Magical Kingdom!! My first memories of disney were having Disney movie nights at our church. We watched the oldies but goodies, Mary Poppins, Bedknobs and Broomsticks and ate popcorn! Good times! I'm wishing pixie dust your way to be able to take your family trip. there's nothing like it. I can remember growing up and watching the Disney movies on tv with Walt doing bits in between. It was some of my favorite tv times. My first Disney trip was in 2002 and we only got to spend one day there but we were hooked. My son was 12 and told us that he was going to work at Disney when he grew up. We just laughed but he did it last year and has applied to go back in May when he graduates. I'd love to win the gift card to give him to use for a special dinner while he's there ( he ate a lot of peanut butter last time. LOL ). 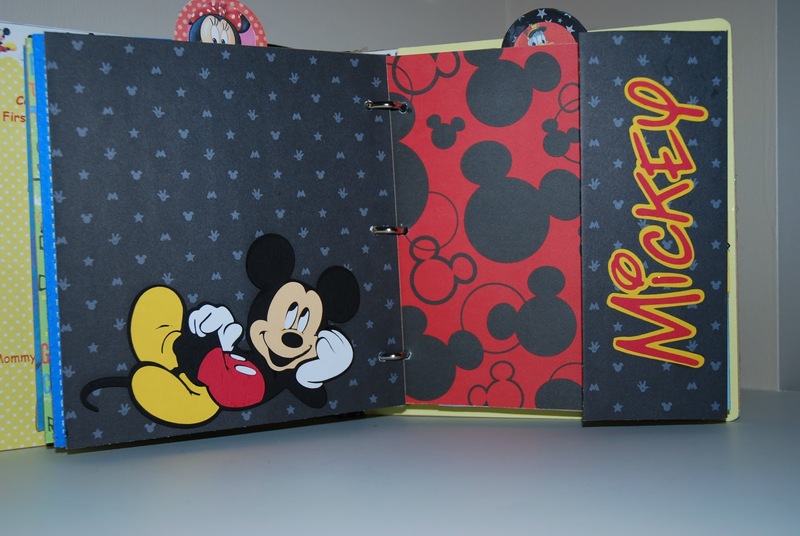 I am giving away my age but I used to watch reruns of the Mickey Mouse Club boy did I want to be a mouseketeer. I love your album. I am wishing for you a magical trip!! We have been several times with my mom and the kids and it was wonderful. ove your Disney Dream Mini Album. Your Charlotte is Beautiful. my first memory was 101 dalmations also. i love the puppies. Ellen, your album is the bomb!!! Simply beautiful. My first Disney memory was when we went to DisneyWorld via boat, plane, and Greyhound bus. You see, we live on the West Coast of Canada on an Island (hence, the boat/ferry ride). Then we flew to Montreal (where I got to meet my FIL for the first time). Then we took a bus across the beautiful countryside to Boston, whereby we flew to Florida. A trip and memory of a lifetime! !